The following is “Part 1” of a multipart essay on the deep history of Western esotericism and its influence on Mexicayotl and other American indigenous traditions. The purpose here is not to “put down our traditions,” as some have suggested in their responses to previous posts—such as “Of Eagles, Condors, and New Age Frauds,” but rather, our intention here at Yankwik Mexikayotl is to investigate and inform you about how these esoteric beliefs have infiltrated and rooted themselves in Mexicayotl since the early 20th century. In order to understand how this happened, it is important to first get a basic overview of the key figures responsible for introducing these insidious ideas. We begin here with Charles Étienne Brasseur de Bourbourg who was a noted 19th century French writer, ethnographer, historian and archeologist. Bourbourg became a specialist in Mesoamerican studies largely due to the confluence between the popular interest in ancient civilizations, the idea of cultural diffusion, and the discovery of “lost cities” in the Americas. Bourbourg’s greater corpus of work significantly contributed to knowledge of the languages, writing, history and culture of the Maya and Aztec civilizations. Nonetheless, his speculations concerning relationships between the ancient Maya and the lost continent of Atlantis encouraged the pseudo-science of Mayanism – which is a non-codified eclectic collection of New Age beliefs, influenced in part by ancient Maya mythology and folk beliefs of the modern Maya peoples. Adherents of this belief system are not to be confused with Mayanists, scholars who conduct academic research into the historical Maya; we’ll call these amateurs pseudo-Mayanists. Bourbourg is a very important individual in the development of early Maya studies. His connection relates directly to the the Popol Vuh, a text written in the Quiche language and which is often referred to as the Maya “bible.” Produced around 1605 by Quiche scholars in Spanish characters, it is the best textual representation of pre-invasion cosmology, religion, and mythology in the Maya world. Bourbourg found a copy of the Popol Vuh along with fragments of other codices in the archives of the Royal Academy of History in Madrid, but the most important thing he found was the Relación de las cosas de Yucatán (ca. 1566), written by the archbishop of Yucatan – Diego de Landa. The Relación is essentially the Mayan equivalent of the Rosetta Stone which allowed the decipherment of Maya writing almost a century later. Bourbourg subsequently published it in 1864 under the title Relation des choses de Yucatan de Diego de Landa. Among the many things Diego de Landa recorded in the Relación, he documented an “alphabet” that was supposed to correlate to our A-B-Cs, but was more of a syllabary which consists of a consonant plus a vowel or a single vowel, such as “be,” “bo,” “bu,” etc. While de Landa is responsible for inscribing the syllabary, neither he nor anyone else really took the time to use it to interpret Maya. The credit for cracking the Maya code usually goes to the Russian epigrapher Yuri Knorozov who in 1952 published a paper that became seminal in the field, but Bourbourg—as far back as the 1860s—had also had the same breakthrough. Unfortunately for him, Bourbourg’s pseudohistorical interpretations prevented him (and those who followed him) from advancing the epigraphy of Maya writing in the right direction. Bourbourg’s ideas surrounding the Maya glyphs were informed by the prevalent beliefs during this early period of archeology regarding ancient “lost lands.” The lands that had been lost to time included Atlantis in the Atlantic Ocean (of course) and a place called Lemuria that had supposedly been located in the Indian Ocean in remote antiquity. Despite making important contributions to the nascent field of Maya studies, Bourbourg was convinced that the Maya hieroglyphs held secret meanings surrounding ancient civilizations, in particular that of Atlantis. This belief was supported by the archaic notion that ancient forms of writing around the world were all connected to a primordial human culture. Although it varied from person-to-person, the line of argument regarding forms of writing went something like this: Atlantis / Lemuria (A/L) > Maya > Egypt > Greek > Roman. In the minds of people like Bourbourg, the more ancient the text was, the closer it was to the original super-civilization from whence all human knowledge originated. This is where perhaps his views about the Maya—views that were simultaneously very influential and intellectually arresting—drew their cultural relevancy. According to Mesoamericanist and historical archeologist, Jeb J. Card, Bourbourg “was convinced that there were secret meanings behind all the hieroglyphs that were all about the fiery destruction of Atlantis … He was misreading the codex … He started creating this whole prehistory of all these things, and one of the words he ‘deciphers’ is Mu, and he thinks that refers to Atlantis.” In essence, the idea of a super ancient place called Mu (Atlantis) is traced directly to Bourbourg. In time, Mu will be separated from Atlantis and rewritten into its own lost continent in the middle of the Pacific Ocean by pseudo-Mayanists influenced by Bourbourg. One such individual influenced by Bourbourg was Augustus Le Plongeon. He was a French-American photographer, amateur archeologist, antiquarian and author who studied the ruins of America, particularly those of the Maya civilization on the northern Yucatán Peninsula. Le Plongeon, along with his wife Alice, traveled throughout Yucatán photographing and exploring Maya ruins, and they are credited with being the first to “discover” and name the Chac Mool statues. But, while they engaged in orthodox archaeological work, they also advanced some strange hypotheses à la Bourbourg. For instance, Le Plongeon insisted that Freemasonry symbols could be traced to the ancient Maya, and that this knowledge had come to ancient Egypt from the ancient Maya by way of Atlantis. The Le Plongeons constructed a really imaginative “history,” that placed the Maya as the cradle of civilization, which then traveled east to Atlantis, and eventually making it to ancient Egypt and becoming the foundation for that culture. Combining their fieldwork with their own fantasies, the Le Plongeons fashioned a story of an ancient Queen Moo (Mu) and a Prince Coh whom they suggested was the inspiration for the chacmools. Le Plongeon’s writings contain many unconventional ideas that were not well received by his academic peers, and in fact, most of them were later disproven. Unlike his predecessor (Bourbourg), Le Plongeon is regarded as one of the earliest proponents of Mayanism. 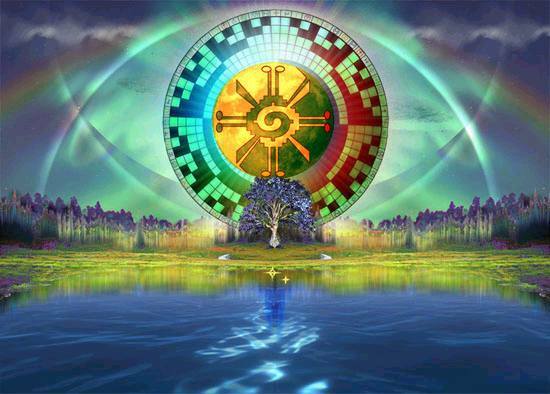 His beliefs of Maya cultural diffusion radiating outwards would later influence the writings and ideas of other proto New Age philosophies, including those of neo-Azteca and neo-Mayas in the 20th century. Following Le Plongeon’s lead, the populist writer and an amateur scientist, Ignatius Loyola Donnelly, advanced the Atlantis hypothesis further and combined it with the fringe concept of Catastrophism – the theory that the earth had largely been shaped by sudden, short-lived, and violent events worldwide. Donnelly subscribed to the notion that catastrophic events had affected ancient civilizations since the dawn of time. He is perhaps best remembered as the author of Atlantis: The Antediluvian World (1882), a book that undoubtedly sparked the interest in Atlantis that continues unabated to this day. By the late 19th century, his work was part of a growing corpus of unconventional ideas and beliefs that corresponded with the writings of other figures, such as Helena Blavatsky (Theosophy), Rudolf Steiner (Anthroposophy), and James Churchward. The idea of Catastrophism should be familiar to many adherents of Mexicayotl, for it is a trope that often comes up in lectures given by elders who conflate the concept with indigenous mythologies. Usually, the Aztec legend of the “Six Suns” or the Hopi creation stories of the “Four Worlds” are bandied about as examples of the supposed reality of these ancient cataclysms. If you’ve made it this far, you’re probably wondering: Where is this all headed, what is it leading up to; and perhaps, where’s the proverbial smoking gun? In the next part of this essay, we will explore how the 19th century pseudo-Mayanists discussed above influenced the early Mexicanists who laid the groundwork for the resurgence of Mexicayotl and the Mexika identity. At the bottom, there is a link to a talk given by a respected Mexika elder, Maestro Ocelocoatl, at the Yancuic Xihuitl 2010 celebration in San Jose, California. The video starts at the 2 minute mark, and it is the fifth part in a series of six. It begins with Ocelocoatl continuing the discussion from the previous Part 4, where he’s explaining the eras of the six suns and their connection to the “acto catastrofista,” or catastrophism. By the two minute mark, he’s talking about 2012, Nibiru, Planet X, and how the rogue planet had been prophesied by the Olmec. The concept of “catastrophism” is not scientifically supported and falls in the realm of pseudoscience; and even if you believe in the debunked notion of a rogue planet existing far off in the distant reaches of our galaxy, Ocelocoatl affirms in the video that the planet would come between Venus and planet Earth on December 22, 2012 around noon. That never happened. If you watch his talk in its entirety, the perspicacious listener will come away disappointed from the numerous glaring errors that Maestro Ocelocoatl makes. That was certainly the sentiment we felt when we first watched his talk all those years ago in 2010. The silver lining here is that we here at Yankwik Mexikayotl decided to shine a light to the pervasive quackery that passes as ancient knowledge and wisdom and expose the lies and distortions in our tradition. We will explore that in Part 2. Tlakatekatl is a long-time Chicano activist, a danzante Mexika, and a scholar with a PhD in history. A founding member of Yankwik Mexikayotl, his research explores Chicana & Chicano indigeneity and its deep connections to ethnic Mexican indigenist nationalism. He has presented at various institutions and conferences, including the University of North Texas—Denton, Southern Methodist University, and the National Association of Chicana & Chicano Scholars (NACCS). He currently teaches history at a Dallas area university and is working on turning his dissertation into a book. “Charles Étienne Brasseur de Bourbourg,” Wikipedia, December 28, 2017, https://en.wikipedia.org/w/index.php?title=Charles_%C3%89tienne_Brasseur_de_Bourbourg&oldid=817406739. “Mayanism,” Wikipedia, accessed May 22, 2018, https://en.wikipedia.org/wiki/Mayanism. Jeb Card and the Mu Stones Pt 1, Archaeological Fantasies, 23:43, accessed May 23, 2018, https://archyfantasies.com/2015/11/23/jeb-card-and-the-mu-stones-pt-1-episode-24/. “Augustus Le Plongeon,” Wikipedia, May 14, 2018, https://en.wikipedia.org/w/index.php?title=Augustus_Le_Plongeon&oldid=841084331. “Ignatius L. Donnelly,” Wikipedia, March 15, 2018, https://en.wikipedia.org/w/index.php?title=Ignatius_L._Donnelly&oldid=830465100.